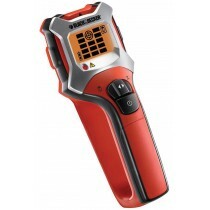 Simple and easy to use providing you understand what the unit is scanning for. For example it wont detect a live power cable if its covered by a metal casing. So detect for metal instead. Ignore some of the test sites which are unrepresentative of the product. If its flashing red to indicate power in the wall everywhere just put your other hand on the wall to discharge the static build up, then it will operate correctly. Always scan three times for an accurate detection. A good product which will save a lot of hassle and worry. Excellent bit of kit. Gives more confidence that when drilling into internal walls etc. you're less likely to drill into something you should'nt. Easy to use. Best price found at Howe Tools & fast delivery, well pleased. Very easy to use with both audible and visible alerts to know when you are passing the device over a material it detects allowing you to get pretty precise location readings. It's great that it can not only detect live cables but also building materials such as metals and wooden stud. It's nice to know that it has automatic calibration. Comes complete with snug carry case and strap. Well featured unit, works well. Better than most for finding studs and mains cables but sometimes gives you a false reading. Not used it in working environment yet. But just practicing it performed well. Top quality product. 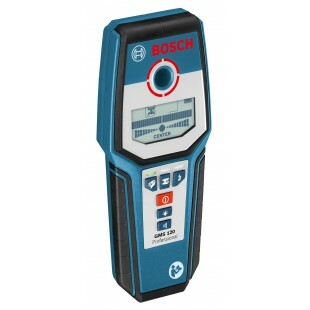 I would highly recommend this Bosch GMS 120 unit. Seems to be doing exactly what it says on the box. A first sight, it seems over sensitive and I am getting false positives for live wiring. 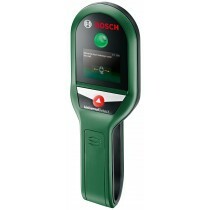 But I will watch the video again on the Bosch web site and give it another go. Slightly disappointed with the accuracy of the instrument as it appears to be confused by more that one element in the vicinity of the detection area being analysed. Does what is says, perfect, I can now drill without having to cross my fingers. the equipment does what it should and has helped me do the job it was intended for. It a great product and excellent proformance. I have had many stud and metal detectors but this is the best. Good depth of search and no false alarms.You can find and centre the object under search. Still getting to know the product, but looks promising. Better than my previous detector. Scanning a wall for wires, battens etc can be tricky. This tool would appear to give the best chance of success. I have tried others, and not been impressed. Simple to use, no problems up to now, seems to find everything even stuff me old cheap one didn't. Performs better than my other detector. Pin points nails in rafters accurately. Invaluable. Not perfect but a lot better than my previous one and certainly gives you piece of mind when screwing down chipboard floors prior to laying new floor on top. Not used it a lot, at he moment, bought it after I drilled through a cable, should have bought it before I drilled. Far too many false readings, fails to give accurate reading of studs through half inch OSB. Just seems to detect items that are not there. Very good product, easy to use.